This is very interesting for me as I've been trying to find a way of creating XMV's for use in UX skins or to replace some of the awful quality preview FMVs there are for some games. I had a lot of help from Rocky5 but I tracked the problem I was having down to the WMV8 intermediate formatting of the MP4s I was using as sources. I was getting strange error measages whenever I tried to convert that WMV8 to XMV. It was suggested it was using MP4 originals where the problem lay and I should trying converting that to AVI first, then WMV8 and finally XMV. It still didn't work with UnleashX and neither did the WMV8 which, in theory should at least be playable from the UnleashX dash. XBMC, of course, played everything OK but I need XMV for maximum UnleashX use compatibility. Rocky5 even supplied a test WMV8, not sure how it was created, and when I used that with the same tools I'd been using without success it worked perfectly. The problem was clearly the WMV8 conversion. However I tried various resolutions and audio bit rate with the software I was using to convert MP4 and/or AVI files to WMV8 and it still all failed. The Properties for the WMV8 files show EXACTLY what it should do but it still won't convert to XMV. The video converter I'm using: MyFFVideoConverter must be the culprit but what it is doing to make the WMV8 it creates incompatible with UnleashX I have no idea. In short if this can help fix that WMV8 problem I'll be very pleased. Getting it to work with MP4 originals, which is what most stuff on YT that I want to use seems to be, would be the ideal. As for the issue converting on your end it 99% guaranteed comes back to audio. 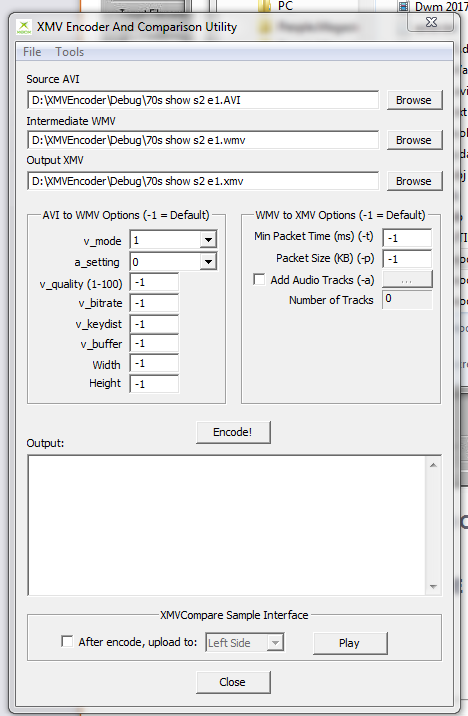 The XMV Tool can only accept WMV8 with WMA9 audio or WMV8 with XBOX ADPCM audio or another PCM audio with the same bitrate. You run into the same with WME8Utils it cant handle compressed audio streams so virtually every file now days will fail. MKV I find the best so far. Some MP4s end up having coefficients clipped which has a cumulative effect of throwing off the timing (not noticeable on short videos but can shorten a vid by a couple seconds on longer ones). H264 MKV I made with Batch22B had no clipping so you get a perfect dub of the audio track. Im sure H264 MP4 made with Batch22B would be fine as well and most H264 based MP4s in general. I can't try it out at the moment but when I do I'll post again if successful or if I have any trouble. I'd almost given up on this problem of converting stuff to XMV so appreciate the help whatever the outcome. Tried it out today with a Serious Sam 2 trailer/demo one of many I've been wanting to use as a preview FMV with UX skins. It wasn't entirely plain sailing. My bloody AV decided to sandbox it because it was "of unknown reputation" which messed it up. So I had to change the settings on that and a good thing I did too because I think when the XMV tool part of the process started it also flagged that up. Anyway once that was sorted: perfect result as far as I can tell. The MP4 converted to XMV but the proof was in the pudding and when I transferred it to Xbox my UX dash played it perfectly. The audio is fine and PQ more than good enough for the game preview purposes I wanted it for. The XMV file size produced is about ten times that of the original MP4 which might be an issue with some of the source MP4s I was going to use. But most are going to be <100MB and that is in line with the existing previews pack. I really appreciate this help and the work you've put in. I'm sure others will be interested in this tool too. Only thing now is I have to tell the guy on another forum who has been very helpful on this mater too that his work has been trumped by your solution. I can probably reduce the final size a bit with minimal quality loss. WMV uses crappy compression and 1 to 1 conversions due tend to be larger than the source file. And XMV is normally larger than WMV since it uses an uncompressed audio stream. Sadly because of inferior compression in WMV and XMV the final video will always be larger than MP4 and MKV unless serious sacrafices to quality is made. Thanks for the additional work you've put into this, much appreciated. The batch conversion capability will be a great help and any reduction in the file size, with minimal effect on PQ, is very welcome too. I'll try to spread the word about this on the other Xbox forums I frequent too. No worries, glad I could help. Just so you know Curb may remove the link or ask you about it. Simply tell him I said it was OK or point him here. #1 The stuttering when solely using FFMPEG is caused by the audio track. 16 bit Little Endian and 8 bit unsigned wave files are "acceptable" to the XMV converter and XBOX but for whatever reason will stutter. Thats why I added the extra step way back of converting to XBOX ADPCM in Batch22B. I saw the same issue first hand and was the only way over the course of 2 or 3 years to fix the issue without resorting to WME. #2 720P will work fine on the XBOX provided the bitrate doesnt exceed 10,000. And there isnt excessive clipping. Every time it clips that removes about a tenth of a second from the video which it tries to compensate for and this results in what appears to be choppy video. Its not that the XBOX cant play it, but rather its playing the video as is. You clip say 20 frames it throws the time off by about .6 seconds and its now out of sync with the index. for %%a in ("inputfiles\*. *") do ffmpeg -i "%%a" -c:v wmv2 -qscale:v 5 -preset veryslow -c:a pcm_u8 "newfiles\video.wmv"
for %%a in ("newfiles\video.wmv") do ffmpeg -i "%%a" -vn "newfiles\audio1.wav"
for %%a in ("newfiles\audio1.wav") do xbadpcmencode "%%a" "newfiles\audio.wav"
Greetz, I ran across this program after trying for years to find something similar and this is absolutly perfect for the uses I would like. Thank you very much for this bit of software that may have never made it to the public domain. It works great, fast encoding and all. I know this is a problem years old, but for those that don't have a lot of money, this helps out with customization. Once more, thanks much for this great converter! In future please forget the fancy colour font. It wreaks havok on the eyes. Please just use straight black and white. When I try using the latest version of Any2XMV, the .exe can't start and I get a message saying "Operation did not complete successfully because the file contains a virus or potentially unwanted software." If I try to use the previous version, the .exe starts, but partway through the process, it crashes.